“I’m solar powered,” my grandmother recently said to me in the deepest, darkest part of the Winter That Just Would Not End. I couldn’t have agreed more, I thrive on sunshine! That day, the sun had poked through for the first time in weeks and we were all in a better mood. That night, I couldn’t handle sitting cooped up at our table for dinner one more time, so we made our way to the patio of a Mexican restaurant and enjoyed what will be the first of many outdoor dinners this season. Our complimentary chips and salsa included a tomatillo and pineapple variety that I hadn’t tried before. One bite was all I needed to try and commandeer that part of the sampler. My husband told me I could make it better. Challenge accepted. By the way – challenge won! Every week I try to make at least one dish that is new or use an unfamiliar ingredient. 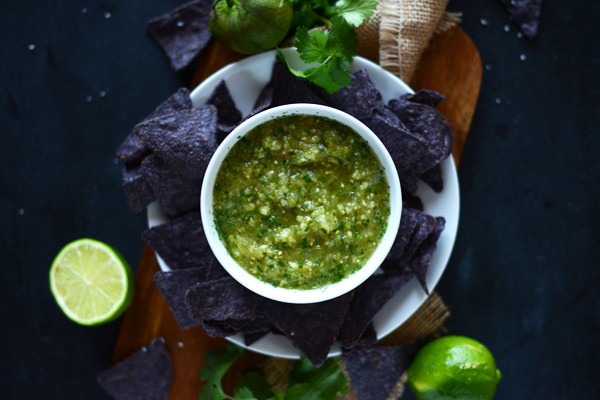 I recently tackled both of those culinary feats with the tomatillo and this homemade salsa. It sounds exotic, but I assure it’s quite simple to prepare. Your tastebuds, on the other hand, will appreciate the complex layers of flavor that range from sweet and crisp to toasty and hot. 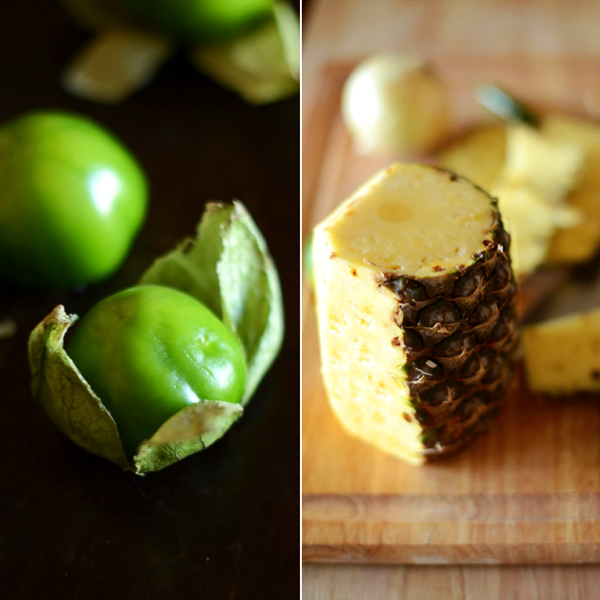 The tomatillo is a Latin fruit that is also known as a Mexican tomato. The tangy flavor makes them an excellent base in many Mexican dishes – primarily salsas, jams, and sauces. We roasted these to bring out the flavor and give it that exceptional roasted taste. 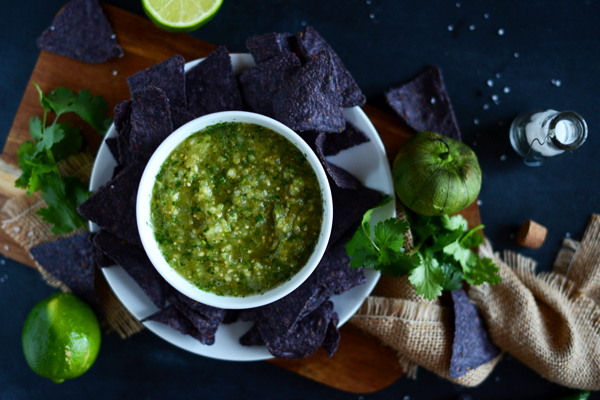 When combined with the sweet and juicy pineapple (which could also be grilled first for even more fire-roasted flavor), you’re in for a serious salsa treat. 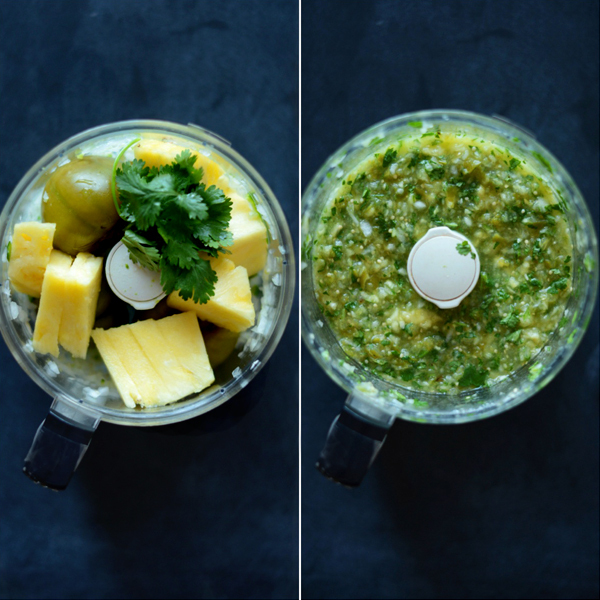 The fresh pineapple and tomatillos are combined with other salsa staples – cilantro, lime juice, garlic, onion, and salt. It’s really not any more complicated than that. Pulse all of the ingredients together in a food processor to your desired consistency – briefly for a thick and chunky salsa or longer for a thinner variety. On the first try, we served ours warm over baked cod and brown rice. It goes down as a repeat meal. The second time we shared it at a lunch party and the bowl was virtually wiped clean. 1. 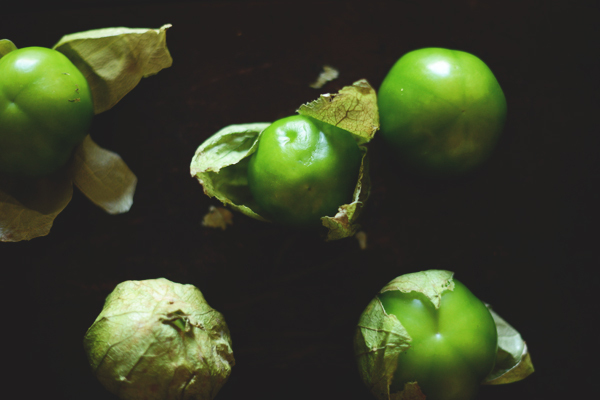 Peel the leaves off the tomatillos, rinse, and place on a baking sheet. Roast in the oven at 400 degrees F for about 15-20 minutes. 2. 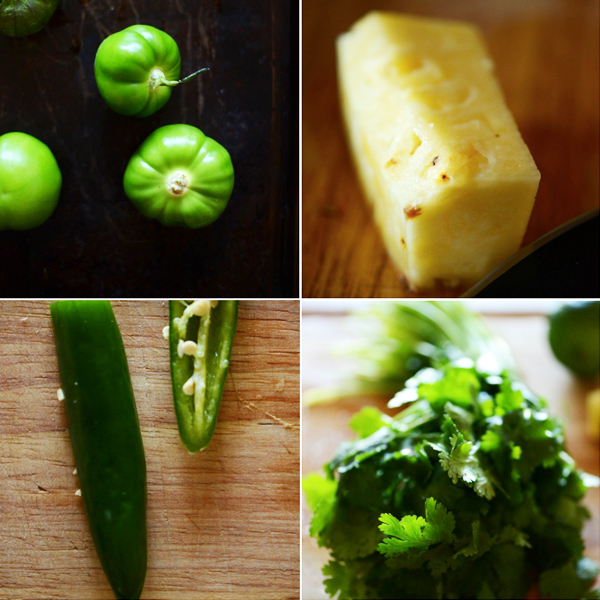 Place the tomatillos with all other ingredients in a food processor and combine until desired consistency (less time = chunkier, more time = smoother). 3. Serve warm or chilled with tortilla chips or over grilled chicken or fish.